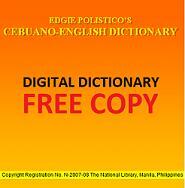 List of English terms that begins with letter E that needs Bisaya meaning and translation. Page 7 of 111 pages. You can help those people that are searching for information about these English word, phrases or terms by sharing your Bisaya knowledge in this website. These are the list of english searched terms that may not yield results like translation and meaning. eat meals at a table, not on the run.